Overview - Single mother Collette is arrested for her part in an unsuccessful IRA bomb plot. Collette agrees to an MIS agent offer to spy on her IRA active family instead of going to jail & losing everything, including her son. How does one decide between two impossible choices? With conflicting pangs of loyalty and survival all competing for dominance, right and wrong are essentially thrown out the window, and all paths are guaranteed to carry a devastating toll. Drowned by the weight of betrayal and tragic violence, 'Shadow Dancer' thrusts its protagonist into a world of unrelenting tension and palpable anxiety, where trust is abused and allegiances are all too fragile. Though certain stretches aren't always quite as absorbing as they aim to be, the methodically paced and delicately crafted film offers an engaging and stirring experience. Based on Tomb Bradby's novel of the same name, the script focuses on Collette (Andrea Riseborough), a member of the IRA who is captured by MI5 after a failed terrorist bombing. Sensing a strategic opportunity, the British government gives the woman two options. She can go to prison and lose her son, or she can return to her home and spy on her IRA affiliated family. Desperate, she chooses the latter, and with the help of her government contact (Clive Owen), she attempts to leak information to help bring down the group. But as members of the organization begin to suspect that there is a spy in their ranks, Collette's life is placed in danger. Perhaps best known for his Academy Award winning documentary, 'Man on Wire,' director James Marsh brings a similar real world sensibility here, opting for a restrained approach both in his storytelling and visuals which avoids sensationalized drama. This leads to a quietly gripping rhythm that slowly pulls the audience into Collette's increasingly dire predicament. And despite the story's inherent political themes, this remains a predominantly character based affair. To this end, the opening flashback sequence carefully and economically establishes the trauma behind Collette's motivations, and this early conflict with guilt is distressingly expanded upon as the runtime continues. Like most understated thrillers of this type, tension is mostly derived from the protagonist's constant threat of exposure, and Collette's shaky cover leads to potent fear and anxiety. As one might expect, her suspicious behavior results in dangerous doubts, and throughout it all, actress Andrea Riseborough maintains an impressive balance of harrowing vulnerability and steadfast resolve, making it difficult to truly know where her loyalties rest. Clive Owen is also noteworthy as her MI5 contact, Mac. A genuinely good man, Mac strives to accomplish his mission without sacrificing or exploiting his asset -- and when Collette's life is placed in jeopardy, the full extent of his commitment is put to the test. Visually, Marsh engenders a low-key, minimalist aesthetic that doesn't bring too much attention to itself, opting to let the inherent truth of the characters and story speak for themselves. With that said, the film is still rife with appropriately dreary imagery and atmosphere. A mixture of impeccable static shots, and slowly drifting movements that often follow characters in unbroken takes, all help to maintain the film's delicately escalating drama and faintly unsettling mood, enhancing the story's solemn tragedy. Though this subtle and deliberately controlled style is admirable, the movie's slow pace and frequent refusal to sensationalize its events does lead to a few lulls here and there. Certain stretches are mostly dedicated to whispery scenes of dialogue and vague glances, and there are times when there's not a whole lot of interest actually happening on screen. Thankfully, the filmmakers make up for these occasionally dry spots with a few solid twists in the third act, adding compelling and surprising layers to the plot and characters that ultimately leave a powerful impression. 'Shadow Dancer' is a carefully understated political spy thriller that examines powerful themes of betrayal, trust, family, and sacrifice. Riseborough and Owens both turn in great performances, and James Marsh's downtrodden, low-key style respects the film's dramatic beats without overly sensationalizing them. Sadly, the pace does feel drawn out and a bit too leisurely in spots, but strong character work and a few interesting narrative turns help to keep the runtime engaging. Smart and insightful, the film ultimately concludes on a rather gut-wrenching note, once again revealing that happy endings are few and far between in the bleak world of espionage. 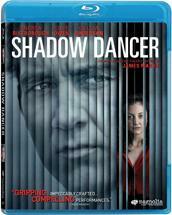 Magnolia Home Entertainment brings 'Shadow Dancer' to Blu-ray on a single BD-50 disc housed in a keepcase. Some skippable trailers play upon start up before the disc transitions to a standard menu. The packaging indicates that the release is Region A compatible. The film is presented in a 1080p AVC/MPEG-4 transfer in the 2.35:1 aspect ratio. With a natural, filmic look and a fittingly understated visual style, the movie comes to Blu-ray with a very solid image. The print is in pristine condition with no signs of damage. A moderate layer of grain is visible but its appearance can look a bit heavy and fuzzy in some shots, especially darker scenes. The film's aesthetic veers toward a soft and faintly hazy appearance, and while this style does hinder clarity and depth, the cinematography works well with the content and detail remains proficient. Colors are a bit bleak, and the picture has a predominantly grey or yellow cast. With that said, blues and reds tend to standout (Collette's red coat is particularly bold), offering some welcome pop. The movie's modest and dreary style isn't as slick or sharp as many other contemporary efforts, but the chosen aesthetic is artistically strong and the transfer is free from any major technical concerns. The movie is provided with an English DTS-HD MA 5.1 track. Optional English SDH and Spanish subtitles are also included. Delicate and quiet, the mix is home to some subtle ambiance that softly enhances the experience. Dialogue is clear and full, but speech is sometimes mixed a bit too low, and for American viewers like myself, some of the characters' heavy accents make speech a little hard to make out in certain scenes. The soundstage is relatively modest, but there is a delicate sense of space, with appropriate ambient effects used to enhance the film's methodical and dreary mood. The heightened sound of a passing train in an early scene, is especially effective, helping to lull the audience into the movie's deliberate pace and rhythm. Likewise, the tense score is spread well and carries pleasing range. The story's few instances of isolated action also come through with an appropriate low frequency kick, but these occurrences are few and far between. With that in mind, design work and music are mostly front-loaded, and given the film's intentionally subdued style, there just really isn't much going on here. 'Shadow Dancer' purposefully avoids sensationalism in its storytelling, and that decision extends to its sound design as well. Restrained but still effective, the track adds a potent hint of immersion that does a lot with very little. Magnolia has provided a slim but worthwhile collection of supplements, including interviews with the cast and crew. All of the special features are presented in 1080i with DTS-HD MA 2.0 sound and no subtitle options (unless noted otherwise). Behind-The-Scenes of Shadow Dancer (HD, 8 min) - Here we get some cast and crew interviews interspersed with behind-the-scenes footage. The participants share details about the story, characters, original book, themes, locations, and documentary influenced style. It's rather short but relatively informative. Cast and Crew Interviews (HD, 27 min) - Interviews with Clive Owen, Andrea Riseborough, Gillian Anderson, Brid Brennan, director James Marsh, writer Tom Bradby, and producer Chris Coen are viewable separately or together. These are all extended sit downs taken from the same sessions used in the previous featurette, so there are some repeated bits. Still, the information is a lot more in depth here, and we get more details on the actors' approach to their roles, what it was like working with the director, and the filmmakers' stylistic goals. AXS TV: A Look at Shadow Dancer (HD, 3 min) - Little more than a glorified trailer with bits of the previous interviews, this is a redundant and unnecessary inclusion. 'Shadow Dancer' is an appropriately bleak and methodical spy thriller that features great performances and commendable craft. Director James Marsh's understated approach can be a little too slow and vague at times, but the film ultimately leaves a strong impression. The video and audio presentations are both rather modest, but they respect the film's intended style well. Though the supplements aren't terribly robust, the included cast and crew interviews do offer some worthwhile insights into the production. This is a solid disc for an equally solid film. Worth a look.